Over the past 20 years, private businesses in the United States have joined forces with federal and local government to improve the efficiency of water systems, spending billions on infrastructure to reduce waste and save money. Despite their efforts, more than 2 trillion gal of water are still lost every year, according to the American Water Works Association (AWWA), reports WaterSignal. While there are several contributing factors, undetected leaks caused by aging infrastructure have become the primary source of water waste. Millions of pipes are buried underground, some dating back to the Civil War, and most are not examined until there is a problem. Assuming every pipe would need to be replaced, the cost over the coming decades could reach more than $1 trillion, according to AWWA. In a time of increasing water rates and major restrictions on usage, the constant breaks and underground leaks are costing both local water departments and property owners time and money. In most cases, property and building owners are unaware of the problem. Some managers compare one water bill to another, accept the cost and pay it without question. What they may not realize is underground leaks, inefficient fixtures and bad landscaping practices consume more water than necessary. Thanks to breakthroughs in green technology, property and building owners now can implement water conservation programs that not only replace inefficient equipment to reduce consumption, but also continuously measure water flow to immediately alert them of leaks. 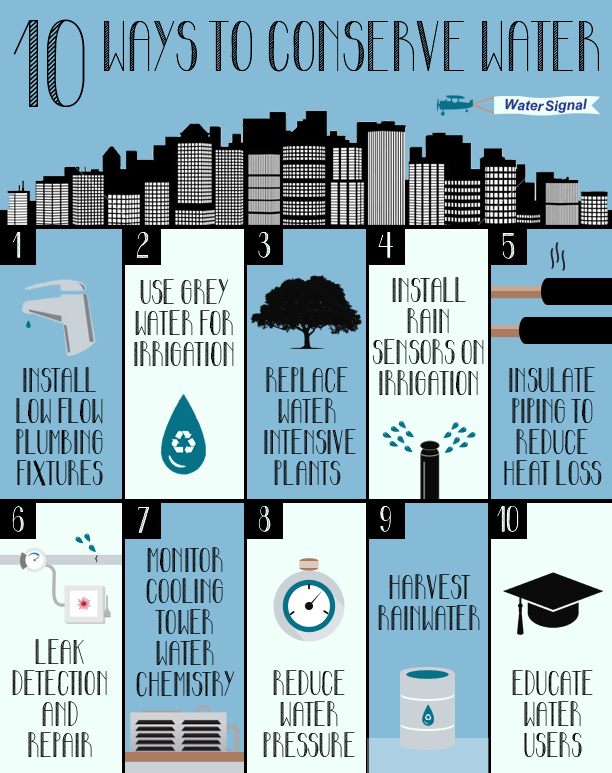 The infographic below from WaterSignal, a green technology company focused on water conservation, offers additional ways building managers, owners and occupants can slow and improve usage.